Long time Football Foodie readers know I’m a big proponent of recipes that can be prepped ahead of time for game day. Game days mean worrying about fantasy football settings, yelling at pregame shows, setting up tailgates and maybe watching a little Premier League if you’re feeling cosmopolitan. An easy but complex tasting marinade that can readied the night or the morning before football? 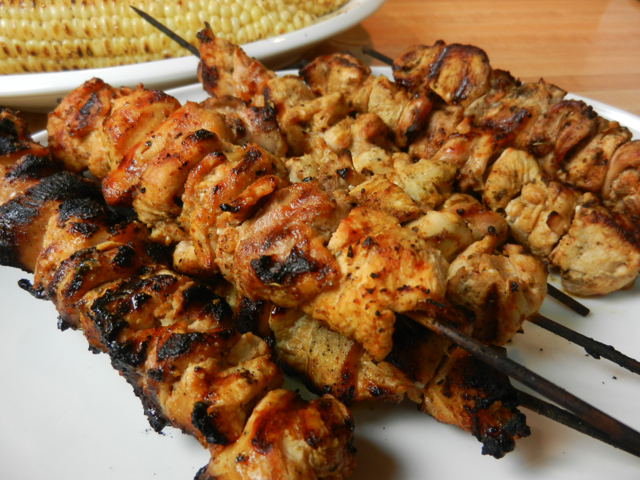 These Special Chicken Skewers fit the bill perfectly. The name “special chicken” came from an old boyfriend of mine who would request a variation of “special chicken” for special dinners, and years later when he first met now-husband, my ex-boyfriend asked him, “Does she make you special chicken? It’s the best.” (We’re all friendly enough that he’s stayed at our place when he’s in Los Angeles, so don’t read into that exchange too much. ) The title just stuck from there. The base of this recipe’s marinade came from an old 1970s copy of the Colorado Cache Cook book my mom picked up from the Junior League of Denver back from when my family lived in the Rockies. I’ve adapted and tweeted it many, many times over the years to get the flavor to be a near-perfect marinade, and to where the main lasting similarities between the two recipes are they have butter and lemon notes and go on chicken. But that’s how we learn anything. Players learn the passing tree before learning combos. Cords before cord progressions. Get the basics and the rest becomes easy. Adapt this recipe in different ways and you have a marinate for roasted bone-in chicken, add cumin and reduce the oregano and it’s chicken for quesadillas, play with how much chili powder and cayenne for different amounts of heat. Keys to making these skewers extra special? Fresh lemon, crushing the oregano to release the flavor and letting the meat marinade off the stick before grilling. When I see people put dry meat on skewers and kabobs then brushing the marinade on I’m always shocked. All that surface area of meat not being flavored? Why? WHY?!??! You are missing pockets of goodness in there! It’s okay if you get your hands dirty putting marinade-soaked meats on sticks, you can wash them clean! Just say no to brushing on marinade. Place the chicken pieces in a large bowl or in a glass roasting dish. Why large anything? So you can get an even amount of marinade on everything. Mix together the butter, lemon juice, paprika, garlic powder, chili powder, ground cayenne, salt and pepper. Pour over the chicken and toss until the meat is completely coated. Don’t worry if your butter starts to firm up again as it hits the cold chicken pieces. As long as you get your hands in it and really toss everything around, the lemon will do its job and get everything deep into the meat. Cover and marinate in the refrigerator for at least two to three hours, up to overnight. When ready to cook, heat the grill to medium high with even coal or gas distribution. 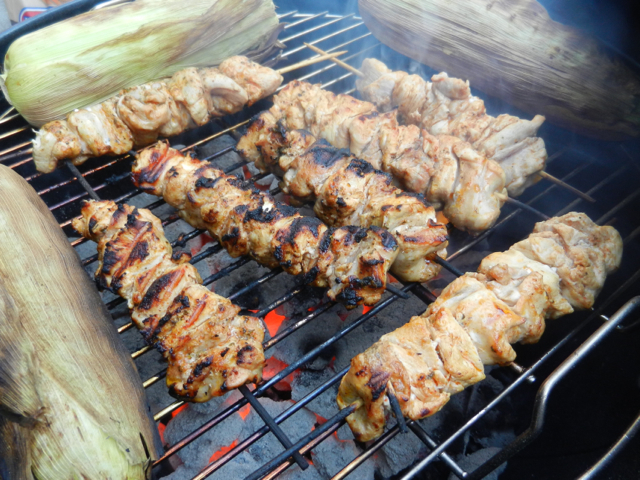 While the grill is heating, thread the chicken on the skewers, discarding the extra marinade. If using a mix of white and dark meat, try to alternate the pieces so the fat of the dark meat can help keep the white meat moist while grilling. Grill for about 2-4 minutes a side, rotating the skewers a quarter turn each time. The meat should feel firm to the touch when done. Let the chicken skewers rest for a couple of minutes and serve. As you can see, I didn’t do a great job soaking my sticks in water before grilling but they held up well enough this time and one skewer hit too much of a hot spot, but overall this came out to be a great batch of Special Chicken. I used the full amount of cayenne for heat, the dark meat and butter kept the chicken from being dry, the taste of smoky paprika enhanced by the flame and the garlic. Great football food. You might also like: Coffee & Pepper Glazed Drumsticks, Ancho and Guajillo Chile Chicken Enchilada Dip and Chicken Yakitori. Place the chicken pieces in a large bowl or in a glass roasting dish. Mix together the butter, lemon juice, paprika, garlic powder, chili powder, ground cayenne, salt and pepper. Pour over the chicken and toss until the meat is completely coated. When ready to cook, heat the grill to medium high. Prep time includes marinading time for chicken.